What is the scope of the bond? The second question ($24,420,000) is for a new school south of town. It would be a kindergarten through sixth-grade building. Click here for more detailed information about the bond scope. How will the district pay for this work? Part of any school district’s bond is paid for by the district’s taxpayers, but currently 28% of new bonds will be paid for through state aid. NOTE: Existing bond debt is supported by 53% state aid – this is the result of a change in state-level funding. What is the impact to homeowners and businesses in the district? Why is this bond more expensive? The board of education and community vision team spent a long time debating the needs of the district. The overarching reason the cost of the bond didn’t go down is because the need didn’t go down. Instead of putting a bandaid on the problem, they wanted to create a long-term solution. Additionally, the need for storm shelters at some of our elementary schools was identified after the previous bond attempt. Originally, the team believed they could refit the doors and do other minor work, but instead they will have to build the storm shelters to be up to current FEMA standards. We also added the deferred maintenance for the HVAC. This was in response to the chiller breaking at NHS. We had to pay for it out of our capital outlay which means less money available to our teachers and classrooms. Lastly, inflation and other construction costs are increasing by approximately four percent a year, meaning less scope is possible for the same amount of dollars. Aren't we still paying for the 1997 bond? No, the district actually paid off the 1997-98 bond early (September 2017). Additionally, by refinancing to lower interest rates twice over the term (once in 2007, and again in 2014), the actions of the Board of Education saved district patrons $199,730.00 in interest costs. What is our bond debt compared to other districts our size? We have the lowest bond debt when compared to districts our size in our region. Click here to view the 2016-2017 regional rates. Due to funding, we will not be able to apply or run a bond issue before July 2019, when we will be competing against other districts for funds. 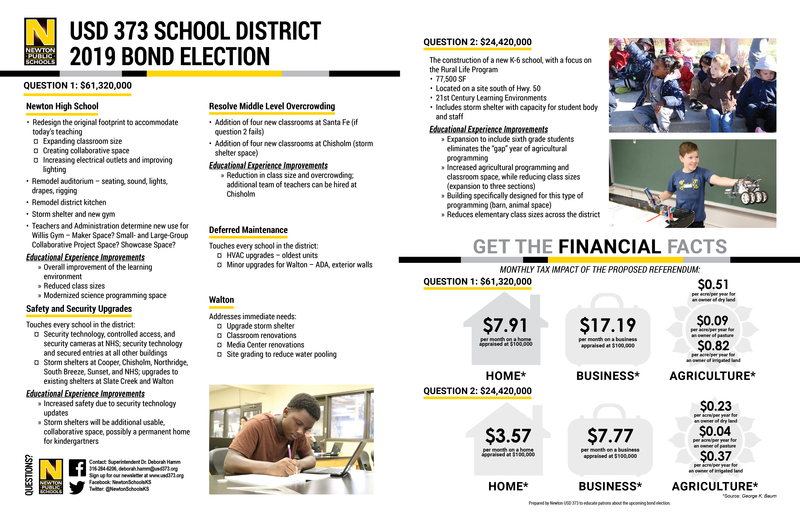 If we are accepted, we plan to have an election on September 3, 2019, but we will not be certain of this until approval from the State Board of Education. Why does the date of the election keep moving? The main reason is the state bond cap. Due to recent changes in state law, there is an annual limit to the funding available for building construction (the “cap” is equal to the amount of bond obligations that roll off the state books each year). We were hoping we could apply for a bond in November and have an election this spring, but because so many school districts passed their bond election, there was no funding available. Since November, a line in the state statute has been brought to our attention. It provides that a district that has been denied access to funds could move up in the list of districts that would be approved in the next school year. The hope is that when everyone applies for funds in July, it would move USD 373 toward the front. Additionally, it would show lawmakers that districts may need more funding. On February 22, 2019, the district made its case to the State Board of Education and requested an Attorney General’s opinion on the statutory interpretation. We’re currently awaiting word on whether this will happen. How does the two-question ballot work? There will be two different questions on the ballot. The first question can pass by itself, but the second question needs the first to pass for it to be able to move forward. This was a decision made by the Board of Education. Why do we need new buildings when we shut down other schools like Washington, Roosevelt, and Lincoln? These schools were single-section schools, meaning we could only have one class per grade level. They also were not ADA accessible. We could have maintained those buildings, but they wouldn’t have met today’s educational standards. So, is it really true that nothing has been done in the science rooms at the high school? The old science rooms haven’t had any work done. We did add a few science classrooms with the previous bond, but the original science rooms haven't had any work done since the high school was constructed, aside from occasional maintenance and repairs. For example, the flooring has been changed – probably multiple times since 1973 – but nothing to change or improve the learning environment. The science wing will have six classrooms, but we have eight instructors; how will that work? There is no plan to reduce the science department. The goal is to get the entire department into the same area, and there are options to reconfigure the existing space to accomplish that. Why is there work being done at Walton if Walton will eventually close if question two passes? The district will need to use the Walton space until the new school is built, which will take two to three years. In the meantime, minimal dollars will need to be spent to keep students and staff safe and in a quality learning environment. What will happen to the program at the Walton Rural Life Center? The plan is to keep the program in place and move it to the new school south of town. Does the new elementary school cost include land? Land acquisition is not included. The plan is to use capital outlay for that. How many "rural" students does Walton serve? As of the last school year, there were thirty-four students coming from within Walton city limits (and the surrounding rural areas). The remaining balance of students come from the city of Newton. How would this impact South Breeze? Since the Walton program will be moved to the new school, students (and their parents) who are currently enrolled or choose to be enrolled at the new school will have the opportunity to attend there. South Breeze’s boundaries currently include areas south of Highway 50. With a new school in that area, the district will begin the process of realigning boundaries to ensure more even enrollments throughout the district. Why do we need another gym at the high school? We only have one regulation-sized gym at the high school right now. Willis Gym is not regulation-sized, which keeps us from hosting certain sporting events or tournaments. Additionally, Willis Gym is not easily accessible and far away from bathrooms and concessions. We also have a growing need for space for our physical education classes during the day. Our gyms are extremely crowded during those times. More importantly, the new gym is not just a gym; it will also serve as a storm shelter. This was one of the most cost-effective ways to build a storm shelter for the high school while addressing an additional need. Will the new gym and storm shelter at Newton High impact parking? Right now, just the drive will need to be relocated, and the goal is to not lose any parking spaces. What will happen to Willis Gym? The teachers and building administrators will decide how Willis Gym will be repurposed to best address the needs of the students and teachers. It could be used as a collaborative space for different classrooms. It could be used as additional physical education space. It is best if the people who work in the building every day design how that space will be used. The design process will begin after the election. I've heard about the possibility of using glass walls in some locations. Will that be safe and are we going to actually use these glass walls? There have been no decisions made about how walls will be constructed. Using glass is a design feature that many schools use for supervision purposes, particularly in areas used for collaboration. These decisions will be part of the design phase which will take place after the election. Student and staff safety is our number one priority. The architects will work with local law enforcement to ensure that every appropriate measure is in place. Will we be adding any student collaboration space? Yes, providing collaborative learning and working spaces for students is one of the driving educational elements to be considered when designing the reconfigured space at Newton High School. Emphasis will be placed on spaces for large and small groups, as well as individual learning spaces, for students to work collaboratively. Will staff be able to talk to you before you come up with plans? Staff will be involved from the beginning of the actual design process (upon bond passage). There will be many months of design and collaboration between the architects and the staff at USD 373, to create the best final product for our students and teachers. When we talk about safety and security, how does it impact the non-original place (i.e. Brooks Trade Center)? The Community Vision Team looked at travel time to get from one area of campus to another. The new shelter would be within the estimated travel time needed for students to reach the shelter from anywhere on campus. Why are we spending so much money on deferred maintenance for our HVAC units? Did the district just not take care of them? Air conditioning and heat was added to our buildings as a part of the 1997 bond projects. Because of this, all of our HVAC units are toward the end of their life. We've been properly maintaining these units; they are just old. This bond will allow us to spread out the replacement of these units so we can avoid this situation in the future.